On the Monitoring settings page, you can configure methods to see cluster alerts without logging in to the Avere Control Panel. Email Monitoring - Send an email when an alert occurs. External Logging - Send alerts to a remote server. SNMP Monitoring - Allow a remote monitor to query the cluster for alerts. After making any changes, remember to use the Submit button to save the new settings. Use the Email Monitoring section to set up email alerts about cluster state. Click the Create button to add a new alert. Enter the email recipients (one email address or a comma-separated list of addresses) in the Email addresses field. Use the checkboxes to select the type of alerts to send. Click Add Recipient to create the alert. Select an alert in the table’s Actions column to use the Modify, Remove, or Test buttons. You cannot change the set of email addresses in an alert. 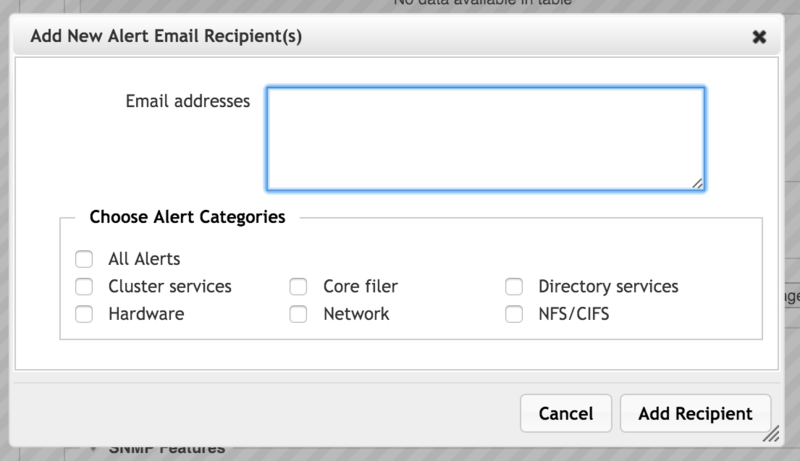 Delete the old alert and create a new one if you want to include different recipients. In the Mail server field, enter the SMTP server (and, optionally, the port) to use for sending mail. In the Mail-from address field, specify the return address to use. The Include additional context checkbox causes lower severity alerts to be included in the emails to help with analysis. The cluster can send event messages to an external syslog server. Use the Logs section of the monitoring page to specify the server. The syslog server must exist before you specify it here. In the Syslog server field, enter the domain name or IP address of the server that will collect the cluster log messages. You have the option to include a specific port. The Test message button sends a short message to the server so that you can verify that the server is receiving information from the cluster. Avere OS exposes a Simple Network Management Protocol (SNMP) management information base (MIB) that can be used to monitor the cluster. 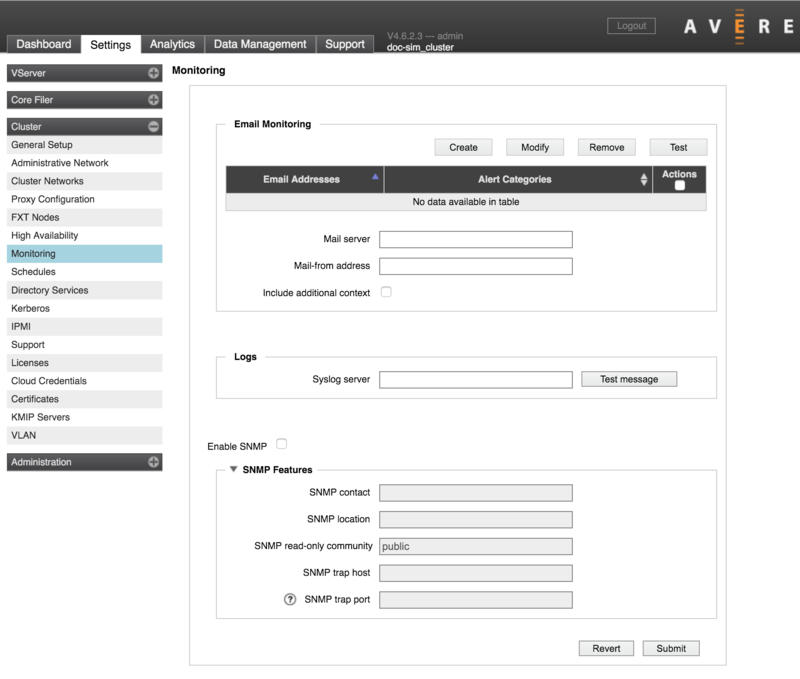 Download Avere’s SNMP MIBs from the Downloads section of the support portal (http://www.averesystems.com/about-us/avere-support). Avere OS supports SNMPv1 and SNMPv2c.